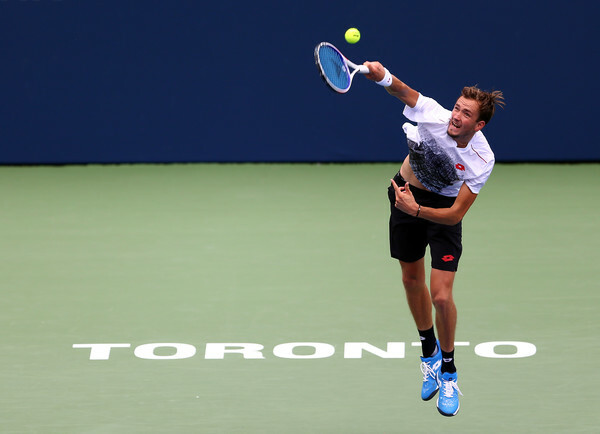 Daniil Medvedev was forced to spend nearly three hours in the dressing room during a rain delay wondering how he had let a set and a break lead slip away during his opening round clash with Jack Sock. The Russian would rally to complete the upset in three sets. 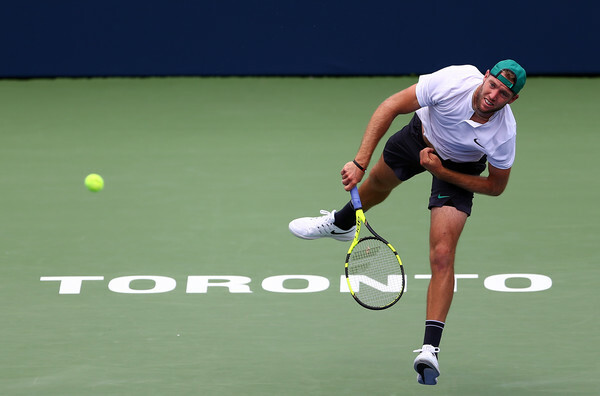 In a wild opening day battle that included momentum swings, unpredictable weather, and a three-hour rain delay, 13th seed Jack Sock became the first victim of an upset at the 2018 Rogers Cup. 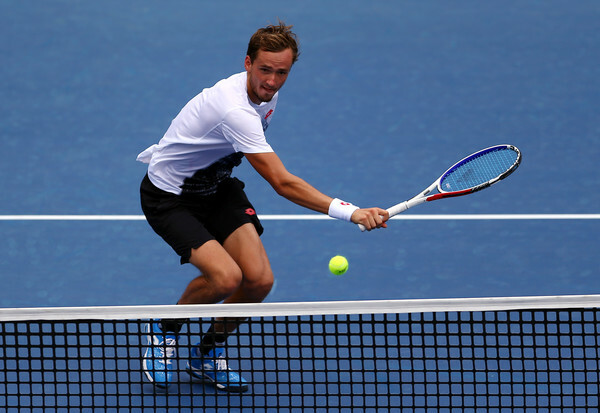 The American was sent packing by Russian qualifier Daniil Medvedev in a three-set battle that needed more than five hours, including delays, to complete. The Russian got off to a quick start in the match, leading by a set and a break. But as the weather changed, so did Sock’s fortune as the American roared back to level the match. Unfortunately for the 13th seed, a rain delay put the momentum back in Medvedev’s corner as the 22-year-old hung on for a 6-3, 3-6, 6-3 victory. The match started out under a clear sky in some hot and humid conditions, which seemed to be favourable to Medvedev. The Russian reached break point in Sock’s opening game, although he failed to convert and the American went on to hold. In his second return game, Medvedev opened up a love-40 advantage and this time converted the second to take the early break lead. 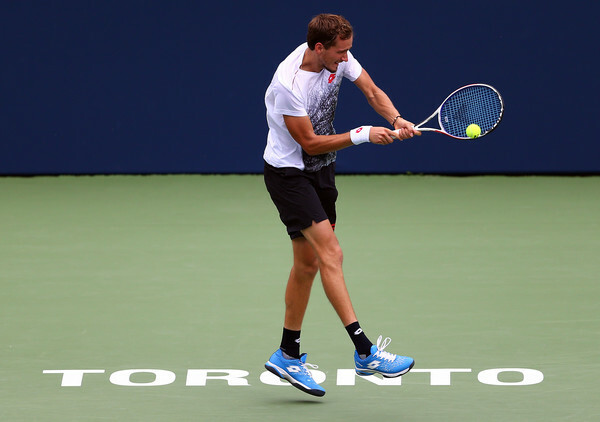 ​​Sock was struggling to find a rhythm, particularly on his forehand, while Medvedev was cruising along. The Russian seemingly couldn’t miss, taking everything Sock threw at him and sending it back hard and deep. The American started to settle into the match on his own serve but had no answer for his opponent’s strong hitting. The lone early break was enough as Medvedev took the opening set 6-3. After starting to find his rhythm late in the first, Sock seemed to hit the reset button at the start of the second set, which saw his forehand struggles return. Errors put him down love-30 in the opening game, but he managed to find his range to win four straight points and hold. But the forehand struggles were not going away. At 2-all, a pair of forehand unforced errors put the American down love-40. Sock managed to use his power to save all three and set up a game point at AD-40, but he missed a routine volley which proved costly. He would pull a forehand wide at deuce before shanking another one to hand the break to Medvedev. After the Russian took the lead, the wind kicked up and the clouds rolled in, leading to much cooler conditions on the court. Two different players came out from the changeover as Medvedev started committing errors that he could not have dreamt of through the first set and a half. Pressured on serve for the first time when trying to consolidate the break, the Russian netted a forehand to go down 30-40. He saved that with a deep forehand approach, only to net a backhand to give Sock a second look and then double-faulted to put the set back on serve. With the sun gone and the cool conditions taking over, Sock was now swinging freely and finding his targets. In Medvedev’s next return game, the Russian struggled to stay with Sock in the rallies and buried himself in a love-40 hole. He would net a forehand to go down a break for the first time all day. Sock would take full advantage, racing ahead 40-love and closing out the set on his second set point with an ace. From a break down, the American had won four straight games to take the set. The wind was really picking up during the changeover between sets and seriously dark clouds were now hanging over Centre Court. The pair waited a while before retaking the court, managing to complete one game, a hold from Medvedev, before returning to their chairs rather than changing sides. Only a couple of rain drops fell, so Sock step up to serve. After only one point, the heavens opened, chasing both men to the locker room. After nearly three hours, the pair returned to the court with Sock reopening proceedings with a hold. Two games later, the new shot clock, in use for the first time at the Rogers Cup, played a role in giving the advantage to Medvedev. At 30-all, the shot clock hit zero just as the American began his service motion, leading to a time violation. He would net his backhand on the ensuing point to go down break point. Sock would save it, only for Medvedev to win an epic rally at deuce. The 13th seed sent a forehand long at 40-AD to go down a break. 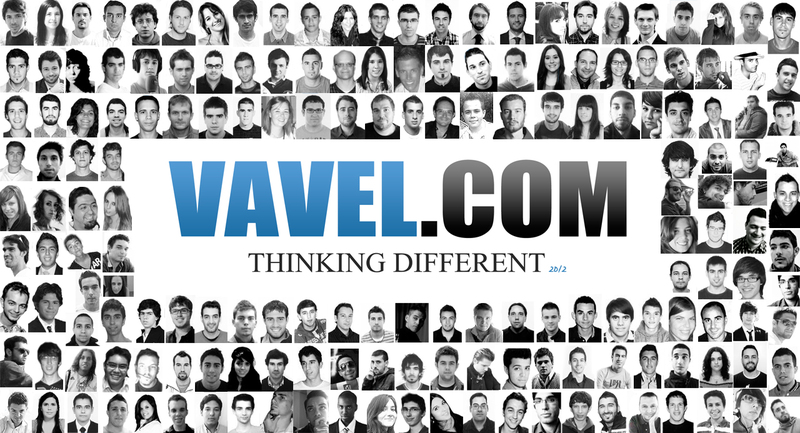 After holding to love to consolidate, Medvedev would have to fight to keep his nose ahead. At 4-2, 30-all, he sent a backhand wide to give his opponent a break point. He would save it with a smart net attack. Sock had his chances to reclaim the break in that game, three more times standing at break point. But the Russian refused to give in, saving all of them with winners and holding for a 5-2 lead. Sock was not going to give the match away, holding to love to stay alive. He then had an opening at 30-all as Medvedev served for the match, but it was not to be. Medvedev’s shot caught the net cord and barely made it over the net, drawing an error from Sock to set up match point. The 13th seed would then send his return long to send the Russian into the second round. Despite only putting 51 percent of his first serve into play, Medvedev was still strong on serve, pounding ten aces and winning over 60 percent of both his first and second serve points. He also saved nine of the eleven break points he faced. 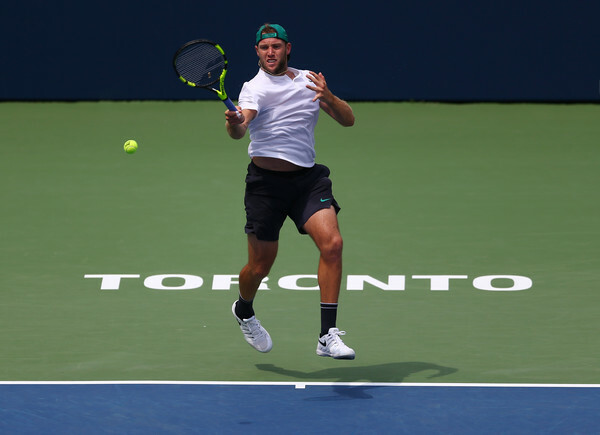 Sock, while putting 76 percent of his first serves into play, had six double faults to only seven aces and only won 58 percent of his second serve points. Medvedev awaits the winner between Lucas Pouille and Canadian teen Felix Auger-Aliassime in the second round.